Additional Info: There is WiFi access on the site and also a laundry room. Payment includes all utilities & visitors (including pets) but does not include bedding covers. We provide duvets, pillows but not the covers. Refundable cheque to be sent before arrival and returned after caravan is left in the condition it was found. Contract agreement required and entry is at 4pm, please do not arrive early, as we need time to complete the changeovers. The Arizona is a special lovely large caravan, with uninterrupted countryside and sea views. 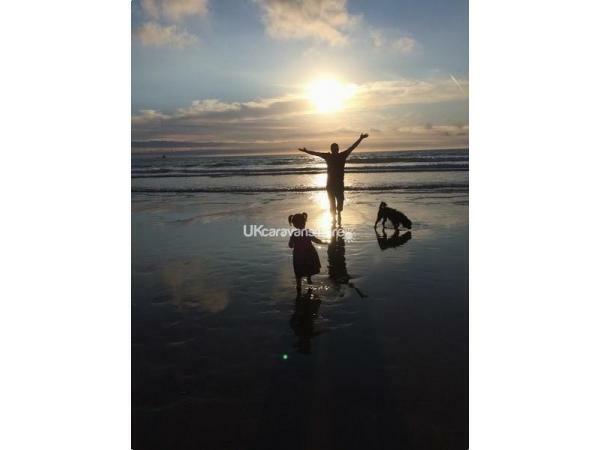 Watch sunsets from the caravan, sit on the decking & see the Golden Sandy Beach of Perranporth and watch the surfers. We are on Falmouth 2, a lovely quiet corner with great views, it's very spacious with all you need inside & out - with the new large decking, you can lounge in the sun and watch the surfers or sunset! Liskey Hill is a lovely friendly place and the Arizona has a quiet corner area for you to enjoy the sun, play and relax. All visitors have been delighted. My Arizona caravan is one of the larger caravan holiday homes at Liskey Hill Holiday Park. It is a spacious 35 x 12 ft three bedroom caravan that can sleep up to 8 people (2 double beds - living room & bedroom, 4 singles in 2 bedrooms). This is a dog friendly caravan and you are permitted happy friendly dogs. We have south facing decking with seating, table and seats, even a toddler chair! We have a new table and seats in the living/dining area and some new mattresses, replacing all of them eventually. 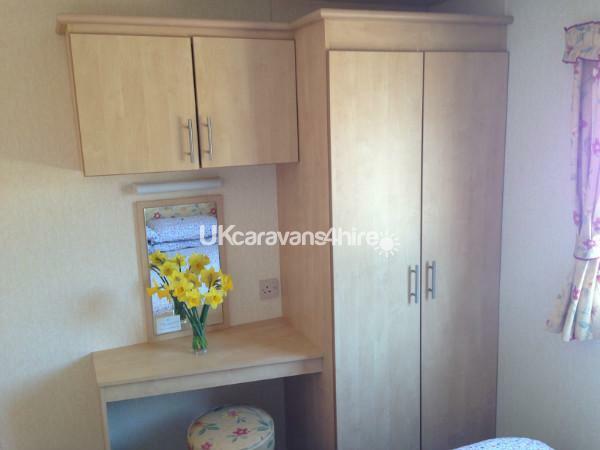 •	One Double Bedroom with cupboard, mirror, storage & dressing table area. •	Two twin bedrooms, both with cupboard/storage area & mirrors. •	Large living room/dining area with LCD Freeview TV/DVD, IPod Dock. * Travel Cot, Changing Mat and toys (under the sofa). •	Great views of the countryside & of the beach and seaside. 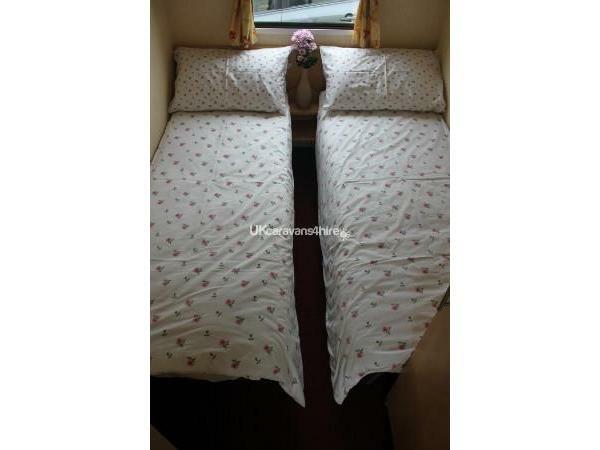 •	Pull out double bed in the living area (plus a lot of extra space in all seating areas). •	Well fitted kitchen with all amenities, microwave, oven, hob, grill & slow cooker. •	A toilet with walk in shower unit & hand basin, new shower fitted & new shower door summer 2019. Hire periods are 7 nights from Saturday to Saturday, this can be negotiated given notice out of season. Arrival is 4pm, departure is at 10am. The caravan shall be clean on your arrival and expected to be returned in the same order. A £50 per week non-refundable deposit is required at the time of booking. The outstanding balance is due at least 2 months before you arrive. A discount shall be given to those paying in full at booking and booking two weeks or more. A refundable cheque shall be required when paying the full payment, this is held and returned after the changeover staff confirm no damage. FULL DETAILS ARE REQUIRED BY THE PARK AND DEPOSIT, Please LEAVE CLEAN AND IN GOOD CONDITION AND GIVE NOTICE OF ANY ACCIDENTS, contact me any queries. You can have a quiet romantic break and never need to leave the caravan with all your home comforts there, or you can walk the Coastal path, have fun on the beach or see the wonderful sites of Cornwall, whatever kind of break you want, you can have it here! Relax, enjoy and watch the sun go down as you enter the carefree world of the Arizona, a holiday to remember! Contact us to discuss any of your needs. The site is a ecig free zone. Our caravan is not new, but refurbished and updated and clean, it’s very pretty! It is not perfect, but it's our home from home, so please be kind, we only have this one home and we share it with you in trust and require notice of accidents as spills have meant a complete re-upholster because we have not been informed and new mattresses so please clean up after yourself and inform us of any accidents immediately to save major cost in long term. We provide duvets and pillows, we cannot provide bedding and please note the duvet in the double room is king size so extra big for big comfort! Thank you for looking us up! We hope you find what you are looking for. Happy Holidays! Additional Info: Small shop, games room & communal BBQ area for your use. Reception open every day. There is a laundrette on the site and they have WiFi at an additional cost. Thanks Kirsteen. Wonderful clean caravan, warm even in December. Wonderful views over open fields to Perranporth and the beach Easy to book, always easy to contact if needed. Everything thought of. I had a wonderful relaxing time with plenty of walking when the weather permitted. Customer service deserves more 10. Regular bus service to Newquay and Truro, stopping anywhere in between. I'll be back. Stayed here in July 2017 for 11 nights. On arrival we had a fruit basket, wine and milk waiting for us which was a lovely surprise. The caravan was very spacious and the dogs loved laying outside on the decking throughout the day. In a nice quiet part of the site with great views over the fields looking down towards the sea. The caravan was really well equipped with every utensil you could need. We ran out of gas on our holiday, but the site office sorted this out within 20 minutes and were very helpful. We used the pull out bed in the room during our holiday as our 2 greyhounds like to be in the same room as us at night, which was a bit uncomfortable but we managed okay. The shower could do with a bit of a makeover as the fittings are starting to rust. You do have to watch what electric you are using as if you have too much on the electric trips out as it is a low voltage van. We had a brilliant holiday though and if i could recommend anything it would be just to update the mattresses to improve the bedroom comfort. We would definitely use again and are considering coming back next year. This was our third visit to perranporth in the last two years and hopefully won't be our last. Hi, thank you so much for letting us share you're lovely holiday home. It is beautiful with fabulously unexpectedly amazing views. The whole week was lovely, romantic for us, great for the kids (thanks for the bonus entertainment) and the easiness of living - slow cooker was great. Kirsteen was so easy to book with and nothing was too much trouble, thanks again, we'll be back and are recommending your van to friends too! What a great holiday. 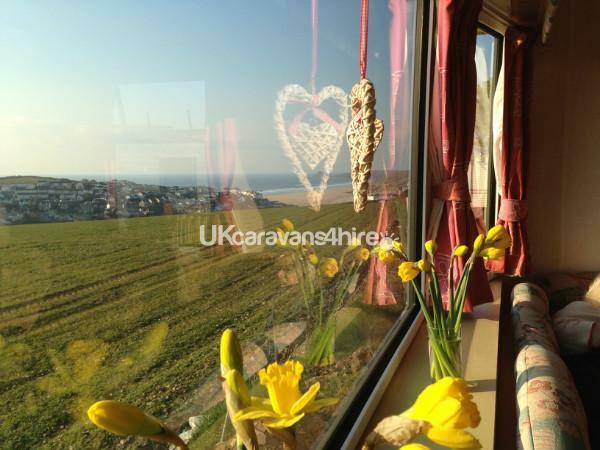 What lovely views and a lovely clean fresh caravan. Amazingly relaxing and hassle free booking with Kirsteen. Loved the space and the warmth and oh what views. Loved it, thanks again for your holiday home, it was a home from home! Thank you, glad you enjoyed it as much as we do, see you next time. Hi, we had an issue in one room when we had our old windows, we now have lovely double glazing and like the rest of the newly refurbished, newly carpeted, new upholstery, new curtains - like the rest of the whole lovely caravan that is also an area we'll work to rectify, thanks. IT HAS NOW BEEN DEEP CLEANED TOP TO BOTTOM AND CLEARED OF ALL ISSUES - CAN ALL GUESTS JUST ENSURE YOU AIR THE CARAVAN WHILE THERE HAVING WINDOWS OPEN, AS THAT IS WHAT CAUSES ISSUES - WE HAVE ALSO GOT A NEW CLEANER! A really lovely caravan in a fantastic location. Beautifully decorated, spacious, clean and welcoming. The caravan has a great decked area which is very useful for allowing both kids and dogs fresh air without escaping. It is about a 25 minute walk down to a beautiful sandy beach. The surf is great and in high season the beach is patrolled by lifeguards. As a family we all had a brilliant time. We would definitely recommend both this van and its owner and hope that one day soon we might be able to return. Thanks for the feedback that's lovely, we've worked really hard to make our caravan a lovely home from home and love the new upholstery, so it's lovely that others like it too and took the time to say, thank you. Last year we stopped at perran sands and it wasn't for us so I started to look at the other sites around perranporth. We where amazed what a lovely quite site this was which is what we liked and where looking for 3 bedrooms ( my parents where coming with us) enclosed decking , (so our old dog could wonder around with out being on his lead). We where very impressed with the caravan it had a fresh, modern feel and great seating area. There was plenty of space and loved having the fridge/freezer. Thanks for your feedback, lovely to Hear! Thank you, you'd love it now with our double glazing and gorgeous new upholstery and curtains! Thank you for hiring out your van. We have had a great week, plenty of walks, eats & drinks. Thank you for everything! Happy to help and glad you liked it. I just wanted you to know how much we enjoyed our staying at your caravan. Great, five star, one of the most relaxing spots we've found, would highly recommend and definately would come back to stay longer!! 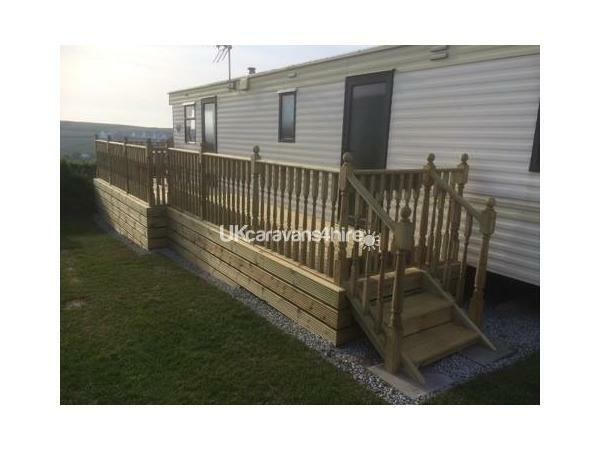 Your caravan was spotlessly clean, well presneted, decking is a great addition, perfectly placed. Many thanks for sharing your holiday home. Thank you, you'd love it now with our double glazing and gorgeous new upholstery and curtains! Thank you, you'd love it now with our double glazing and gorgeous new upholstery and curtains! It was a pleasure to help, anything I can do t make your stay brilliant, I aim to have guess as happy and as in live with it as my family Are! Wonderful, fab, great place, great views, easy booking all the way. Love d it, we'll be back, booked next year already, enough said! Thank you, you'd love it now with our double glazing and gorgeous new upholstery and curtains! Yes the views are spot on, glad you enjoyed, it us rather romantic, especially if it is a clear sky and you see the wonderful sunsets over the sea, my wee piece of Heaven!